Foraging. There is something special about gleaning from the wild. As a child, we'd go berry picking in the long and lazy days of summer, foraging for blueberries and blackberries, dewberries and raspberries, sometimes at summer's end for grapes. This was at my aunt's bungalow in Brookfield, Connecticut. Grown up, I remember searching around Wilton, Connecticut for much the same provender. Once, boating with friends, we went clamming, bare feet squelching in the underwater ooze for anything hard - a rock, a clam - until we gathered enough. And back on shore at our friends house, a feast of white clam sauce and red clam sauce over linguine. Here in New Jersey I've learn to go mushrooming. I'm only comfortable with unique mushrooms that have no dangerous look-alike counterparts. Golden chanterelles and their little black cousins, trompet de mort. Chicken of the woods. Puffballs. Morels - if only I could find them. 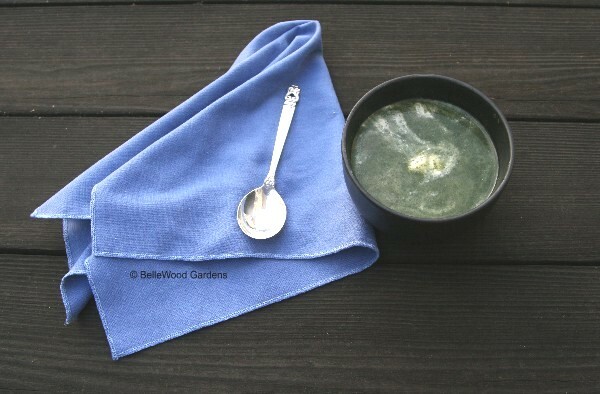 This spring I enlarged my repertoire, and picked well named "stinging nettles." See the little hairs? Incautiously handled, they break off in your skin with an itching, burning, very painful feeling. One day, the summer we were were living in Leiderdorp, in Holland, my daughter fell off her bicycle into a patch of nettles. Ten years old at the time, she was wearing a pair of shorts and a little jersey. Such an outcry! A kind lady brought Mira into her house, smoothed some ointment on her tender skin, gave her a cookie, and sent her back on her way. No doubt with an admonition to be more careful in the future. So when I decided to pick nettles I rolled down my sleeves, buttoned the cuffs, and put on a pair of dishwashing gloves. 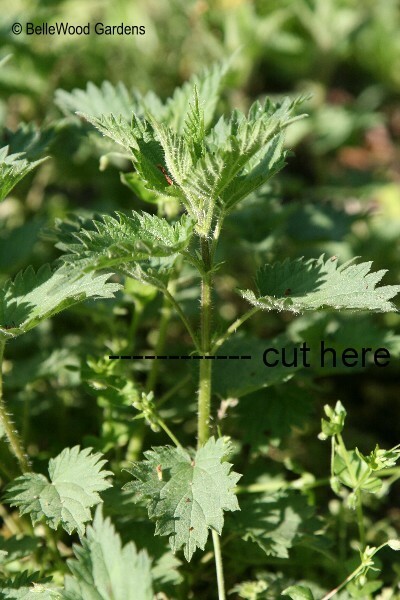 Nettles should be picked while young, well before they flower. Take only the young tips and the pair or two of leaves below. And pick lots, because the stems are going to be discarded. I filled a plastic grocery bag. 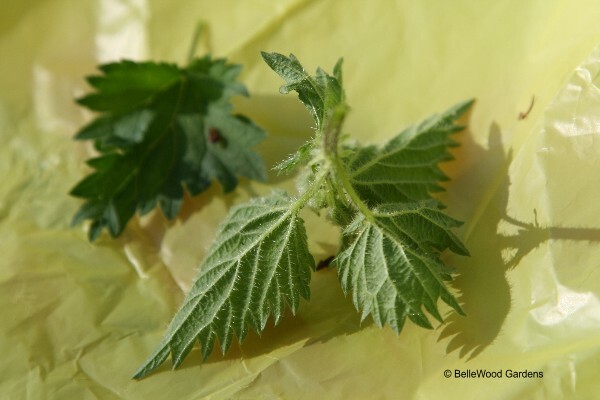 Nettles are a spreading weedy plant. It didn't take very long to fill the bag. Doesn't harm the plants either. They'll just sprout more shoots lower down the stem. Back home, I dumped half the bag of nettle shoots into a basin of water. Wearing lightweight plastic gloves, I swished them around, drained, and refilled the bowl with more water. Pinch off the tip, pluck off the leaves, and repeat, until I'd packed a quart container full. Dice an onion, dice a potato. Saute in a little butter. Add a quart of good chicken stock. Simmer until tender. Add the nettles, and simmer another 15 minutes, until the nettles are tender. Let cool. Pulse process in a blender to homogenize everything. Almost ready to eat. If necessary, thin with a little more stock. Salt to taste. Re-heat, or eat cold, with a dollop of cream. to prepare for the freezer. A taste of Spring, when winter makes it seem so far away. Leftovers for lunch actually started last Sunday. 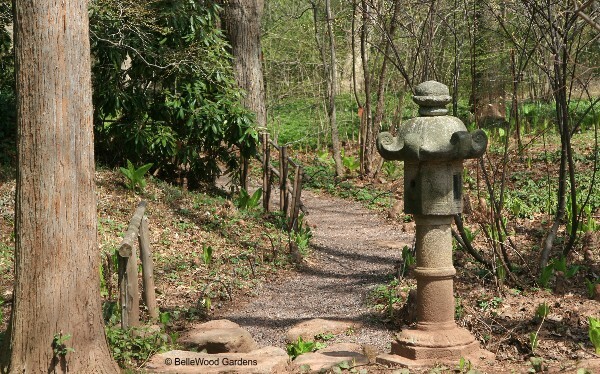 After we finished visiting Buck Gardens, a quick in-and-out at Natirar, and then a quiet walk at Willowwood it was time for me and Shohei to get back to BelleWood Gardens. Paul and I had invited Shohei to stay for dinner, our neighbor John would join us, and Carol, his wife, would be along later. So I planned a couple of appetizers, Shohei brought ingredients for another, I mentioned the soba, buckwheat noodles in my cupboard, and then there was the main course. And, oh yes, Shohei brought dessert. Enough food for five people? Leftovers. I often cook, planning on leftovers for a makeover into another meal. 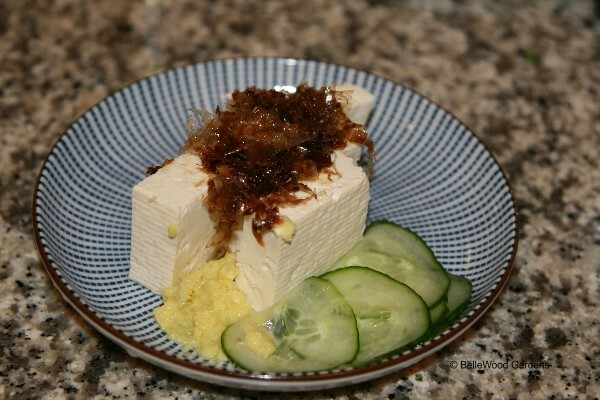 garnished with dried shaved tuna briefly marinated in soy sauce. Grated ginger for a little heat. (Shohei brought it from Japan for me last year) earlier in the morning. Pretty to look at, delicious to eat. my Wolf range does a great job. Rice, and quick pickled radishes for crunch and tartness. 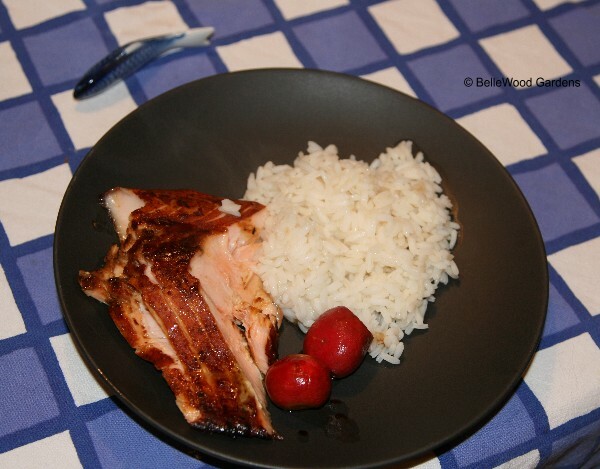 A little soy sauce, less sugar, some rice wine vinegar, and a few drops of sesame oil. 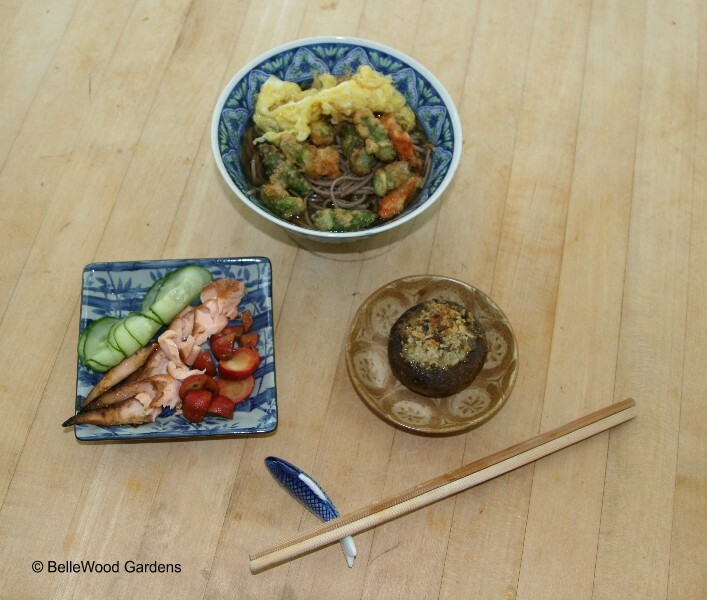 made more tempura vegetables and puffed the leftover egg as Shohei had demonstrated. Great umami, great lunch. "Do you know any good rain dances?" asked Suzannah, when I was at Wave Hill last week. "It's so dry the poor tulips are withering almost as fast as they are opening." And the next day, Shirley, a friend across the Delaware River in Pennsylvania told me she's going to have to water her garden because it is so dry. This is April. It's not supposed to be dry in April, it's supposed to rain and be wet. There is a charming little book by Karel Capek, first published in Czech in 1929. "The Gardener's Year" is a collection of amusing essays on topics that all gardeners can relate to, alternating the months with subject-themed writings. The Blessed Rain falls between The Gardener's May and The Gardener's June. It's dry, Karel writes, clouds promise but do not deliver. And then: "But once again storms murmur on the horizon, wind saturated with moisture springs up, and here it is: strings of rain hiss on the pavement, the earth almost breathes aloud, water gurgles, drums, pats, and rattles against the windows, tiptaps with a thousand fingers in the spouts, runs in rivulets, and splashes in puddles, and one would like to scream with joy, stick one's head out of the windows to cool it in the dew from heaven, one whistles, shouts, and would like to stand barefoot in the yellow streams rushing down the street. Blessed rain, cooling delight of water. Bathe my soul and wash my heart, glistening and cold dew." "A cold front is forecast to move into eastern Pennsylvania late this afternoon and then across New Jersey and Delmarva this evening. Some heavier showers . . . and perhaps some thunderstorms . . . will likely accompany the frontal passage. Rainfall amounts up to 1 inch are expected . . . with somewhat higher amounts in a few spots. This is mostly welcome rain as rainfall totals for the month of April so far are 1.5 to 2.0 inches below normal in many areas. Few if any flooding problems are expected." They sound like gardeners, don't you think? Rain, lovely rain. There was a scant 2/10ths of an inch on Saturday morning, another 3/10ths this morning. Afternoon is shading over into evening. And when I checked just now there was 1.35 inches in the rain gauge. Rain, lovely rain. Blessed rain. 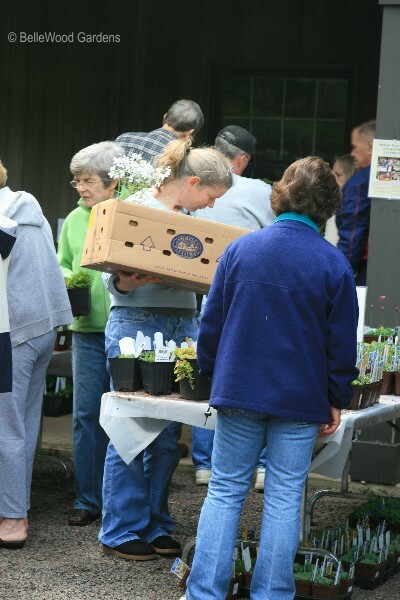 Yesterday was the plant sale at The Leonard J. Buck Gardens. I was here then, and I'm happily back again today. Why? Because I'm here with my friend Shohei. Gardens are wonderful at any time, but especially so when you can share them with a friend. Even better if they have never been to the garden before. And when it is at a time of year that the garden (wonderful though it is at any time of year) is exceptionally lovely - well, it just doesn't get any better. 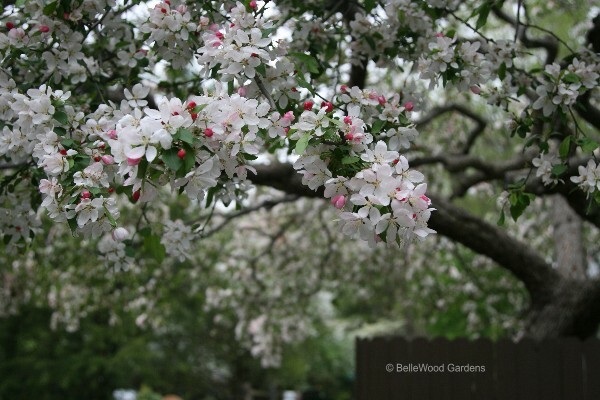 The crabapple opposite the visitor's center is in perfect bloom. with moonstone gems of water droplets. though truly, there are primroses throughout the garden. 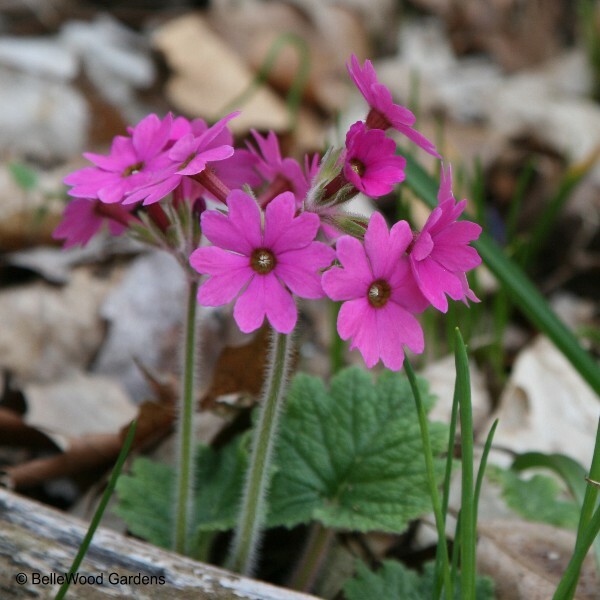 and strews its cerise pink, pale pink, and white flowers in various wet areas. 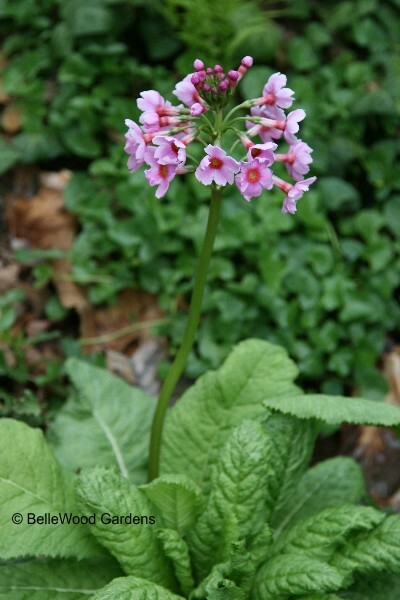 Primula sieboldii prefers it slightly damp but not definitely not soggy. 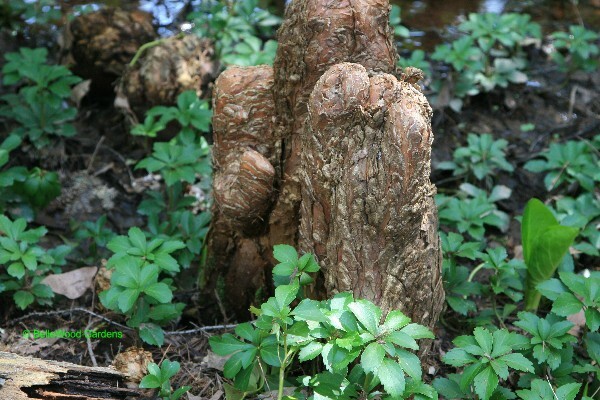 In summer it will withdraw down to a small resting bud, and then perform again next Spring. 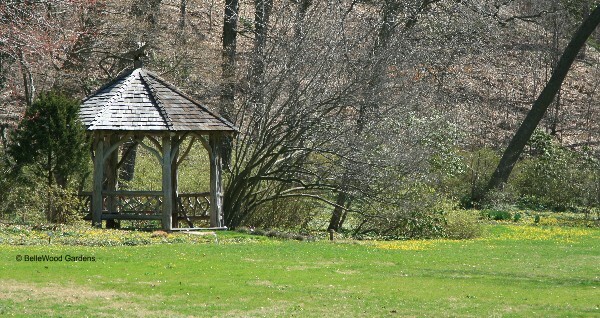 A contemplative moment in the gazebo, enjoying the view. 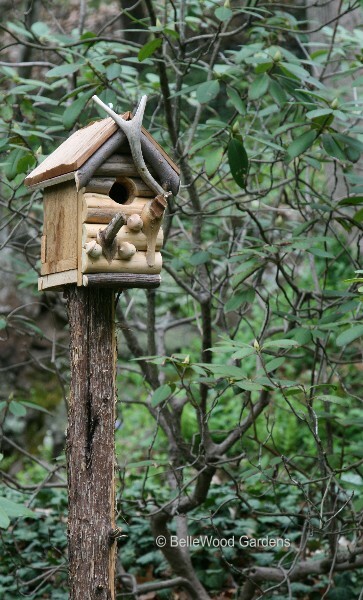 embellished with a few wooden acorns, even a wooden wren. 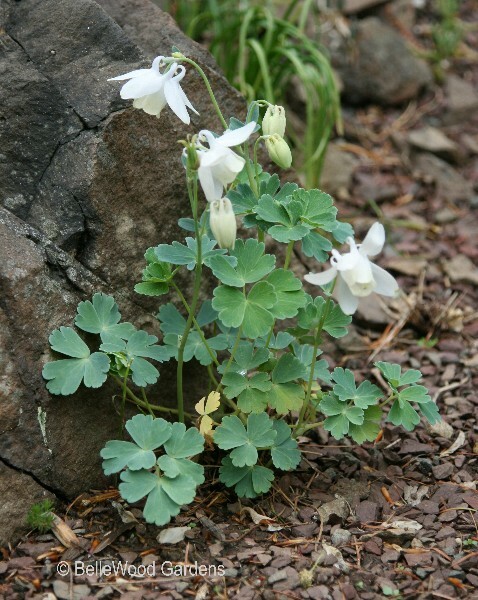 Better conditions at the base of Big Rock offer a home to a different columbine. 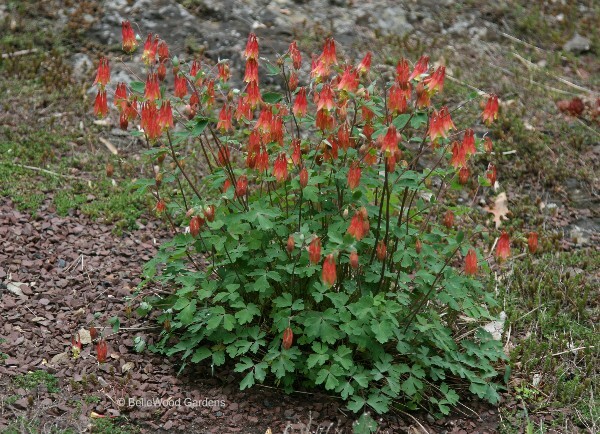 dwarf columbine with fan-shaped leaves. There, that wasn't so bad now, was it. 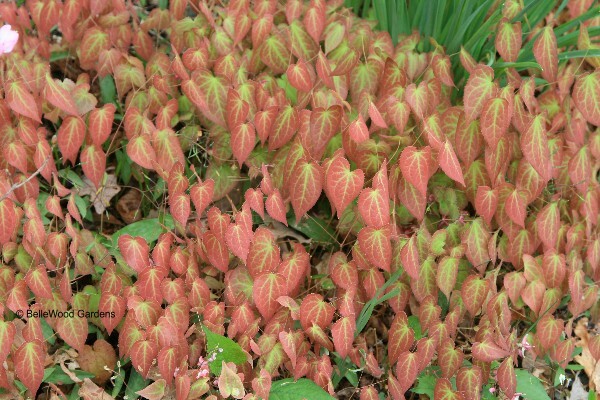 that the leaves have survived to a more mature size and can efficiently work for the plant. 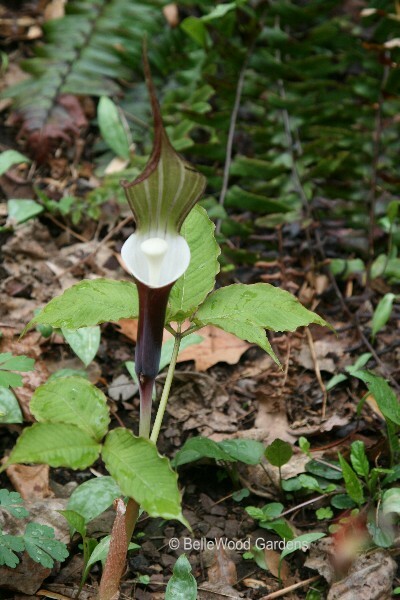 yuki-mochi-so, snow ricecake plant, Arisaema sikokianum. 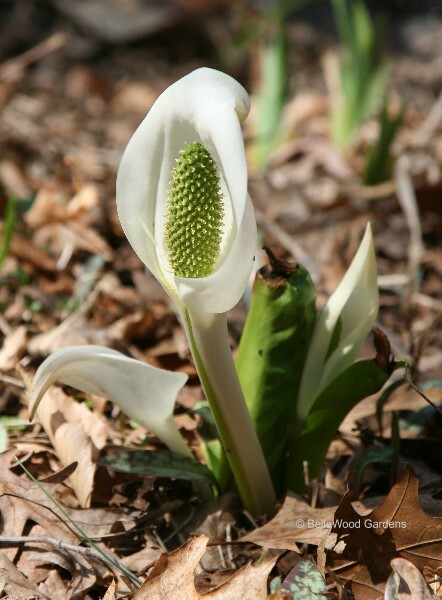 Its Japanese name refers to the white, club-like spadix. and for me, to reflect on a wonderful day in each others company, in a garden. 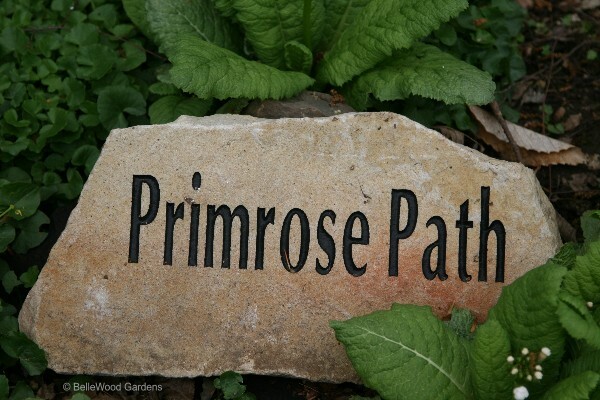 co-sponsored with the Watnong Chapter of the North American Rock Garden Society. I arrived a scant 20 minutes before the 10:00 a.m. opening. It's orderly. That means I'm at the back of the line. Karen Curry, Watnong coordinator for the sale makes a last minute check. 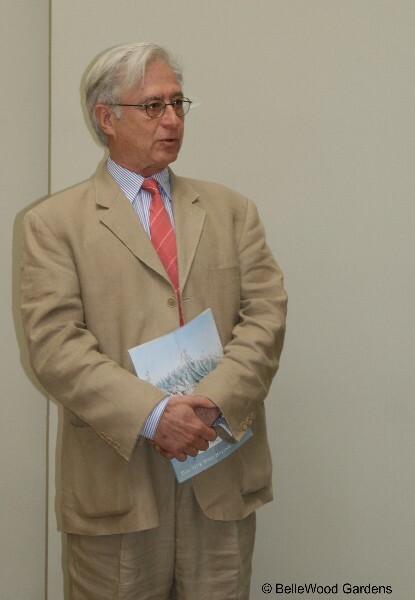 Frank Goodhart was coordinator last year, and for many years previously. and buying plants is de rigueur. After all, it's for a good cause. unless I see a hand reaching for the last one of something I want. Happy customer, happy staff. A good time had by all. 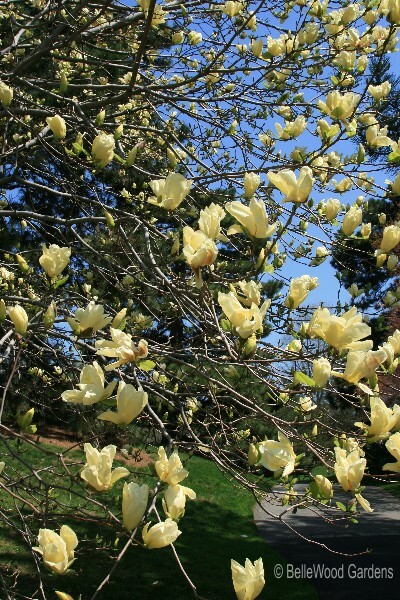 This has been the most superlative Spring season for trees in bloom. No untimely frost to mangle the magnolia petals into brown crumpled kleenex, no heavy rains to rip delicate petals from fruit trees. The peach orchard at a nearby farm looked like a field of bubblegum. 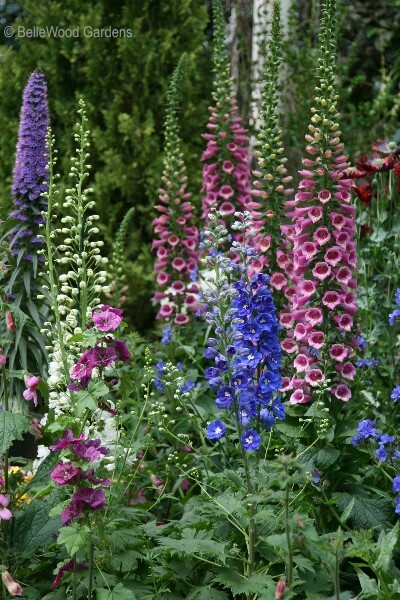 I'd never before noticed the shifting tints of pink in different cultivars, some a little paler, others deeper. 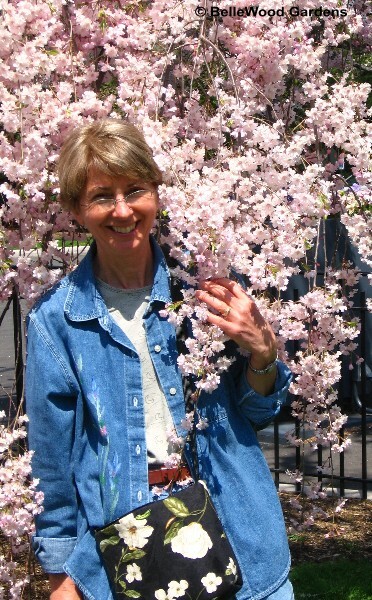 So on our visit to The New York Botanical Garden Joan and I were delighted with the cherry trees in flower. shading paint. With sakura, a cherry tree, in perfect bloom. 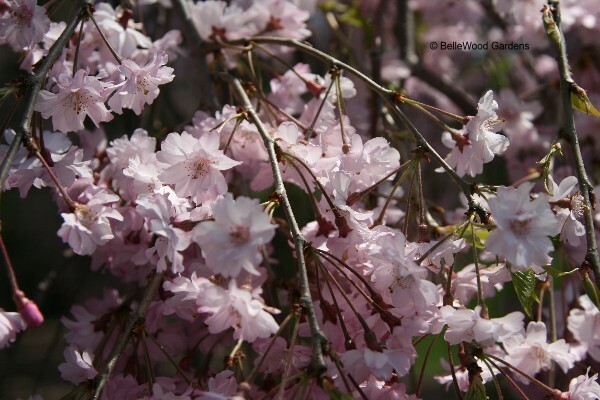 on either side of the steps, their trailing branches a veil of soft pink. So beautiful. At once delicate and profuse. Caught in a waterfall of flowers. Joan's smiling. She's happy. Who wouldn't be. 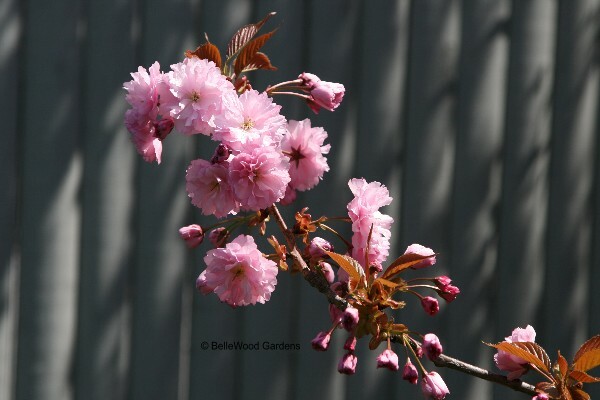 The cherries in flower are certainly well worth celebrating. But they were not the only trees in bloom. 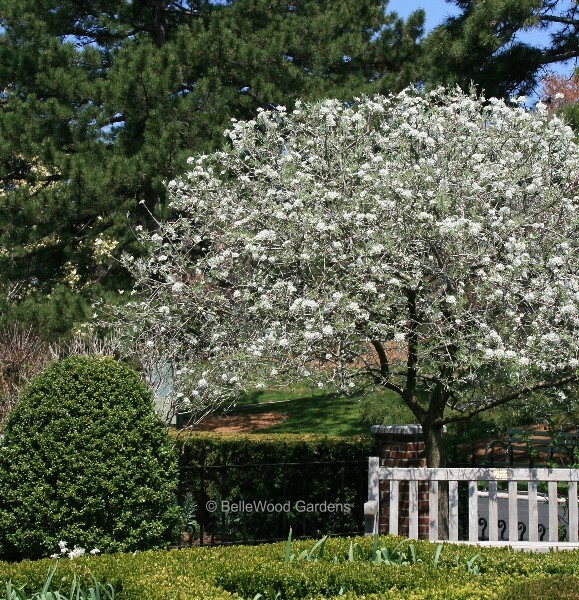 A willow-leafed pear tree in the Nancy Bryan Luce herb garden. There are three of these lovely little trees in the herb garden. nearly pendulous shoots, is not commonly seen. Timmy Foster had one in her garden in Falls Village, Connecticut. it is hardier than suggested. Now, if only I had a source . . . .
have dropped their petals. The aptly named saucer magnolias are at peak. 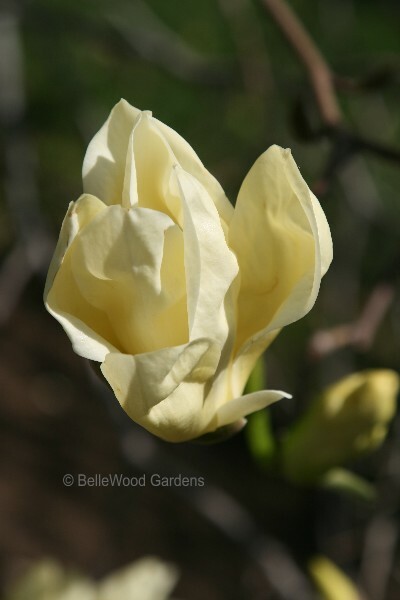 'Elizabeth' was the first yellow-flowered hybrid magnolia to be widely available, and it is still one of the best. Tulips. 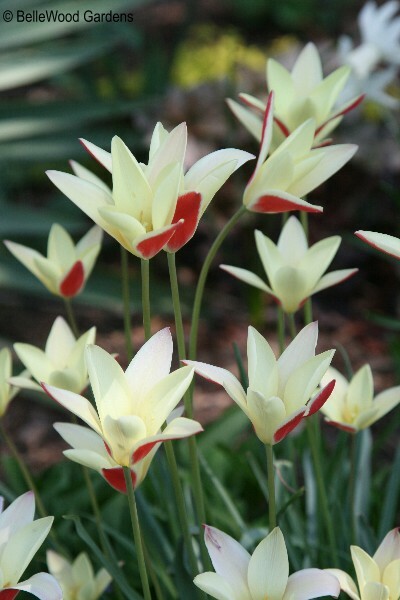 Bulbs from the arid steppes of central Asia, adored by potentates and gardeners alike. (I recall a story that there was a sultan, ruler of the Ottoman empire, who would throw lavish parties when his tulips were in bloom, and in the evening candles afixed to the backs of tortoises would illuminate the garden.) Introduced to the West in the 17th century when Ogier Ghiselin de Busbecq, Ferdinand I's ambassador to the court of S�leyman the Magnificent in Constantinople sent seed to his friend Carolus Clusius, professor of botany at the University of Leyden in the Netherlands. Subsequently the Dutch went crazy for the bulbs, when the Tulipomania of 1634 to 1637 saw individual bulbs selling for prices that make the dot.com bubble look modest. Flowering as they do when gardens flourish in Spring, arrayed in rainbow hues, you'd think tulips would be standard in every garden. 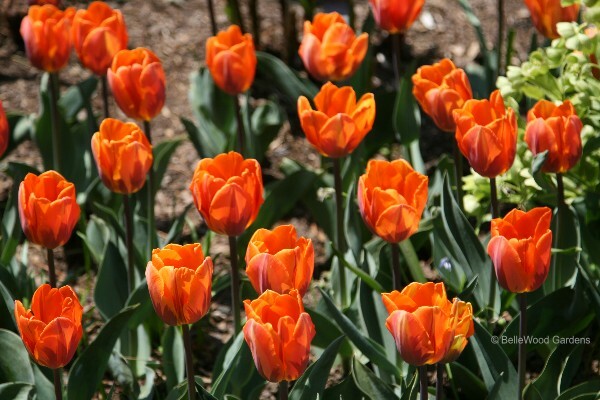 But wait, and - setting aside the fact that tulips need cold winter vernalization to flower - consider these facts. 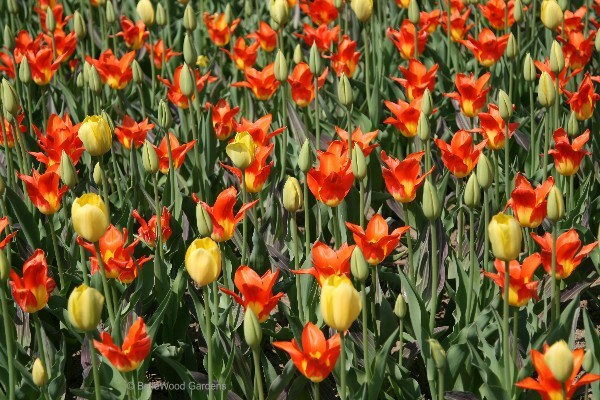 Tulips arose in arid regions. When watered in summer, while dormant, they become confused and in subsequent years many send up only a single "rabbit ear" leaf rather than flowers. And it seems that those critters that think of gardens as salad bars especially enjoy tulips. From whitetail deer to tunneling voles and chipmunks, one eats the flowers and the others eat the bulbs. 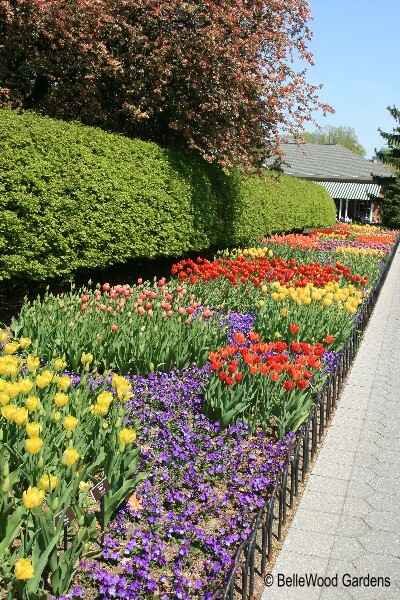 Public parks and gardens are great places to enjoy displays of rainbow-hued tulips in peak of perfection. And that's what Joan and I enjoyed at The New York Botanical Garden and Wave Hill today. so that every Spring it is a new delight, like this picture postcard bright riot of color. 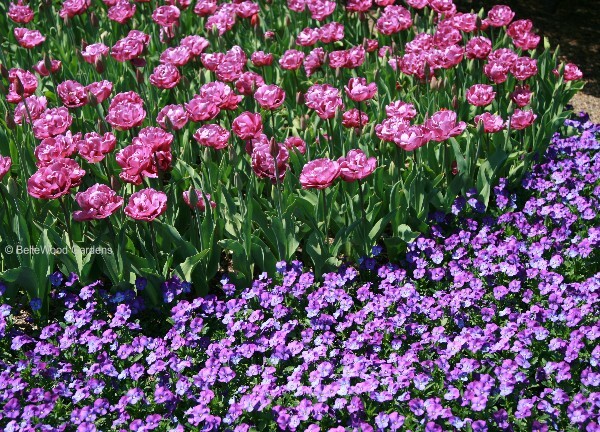 to order, dig and plant, then dig and discard after flowering is over. What matter? Come here, and enjoy the Persian carpet of color without all the labor and expense. At home, tulips on a smaller scale are more effective, and more readily accomplished. 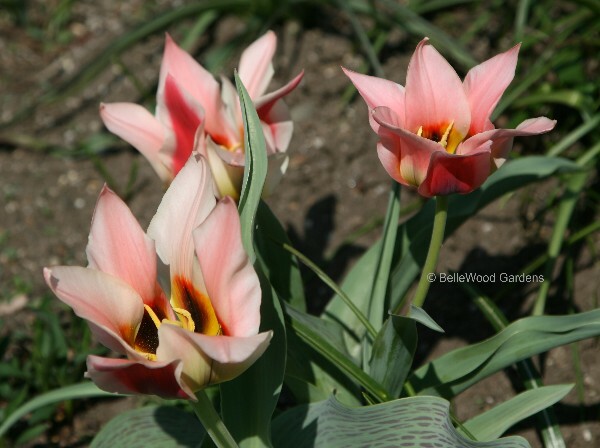 paired with double tulips, flowers crammed full of pink petals. 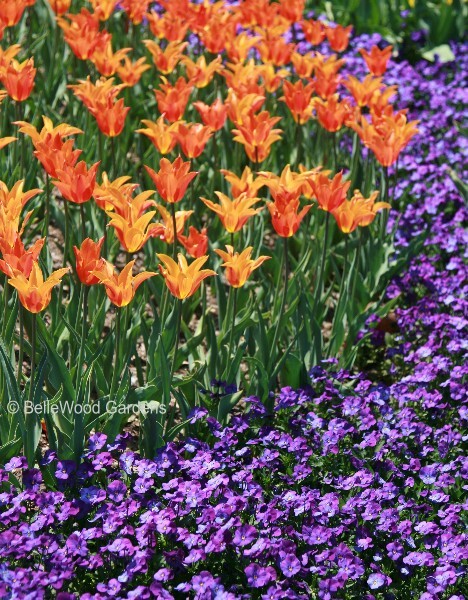 and paired with purple violas, two complementary colors in strong contrast. 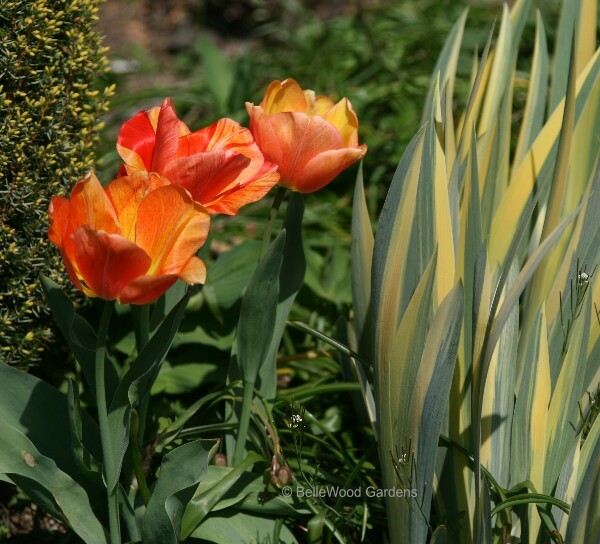 An interesting planting at Wave Hill juxtaposes two different tulips. still tightly furled in the remainder of the display. live up to their name and shine in the Jane Watson Irwin perennial garden. more elegant than a combination of those colors might suggest. like some bar code markings to be scanned electronically, that reveal its parentage. 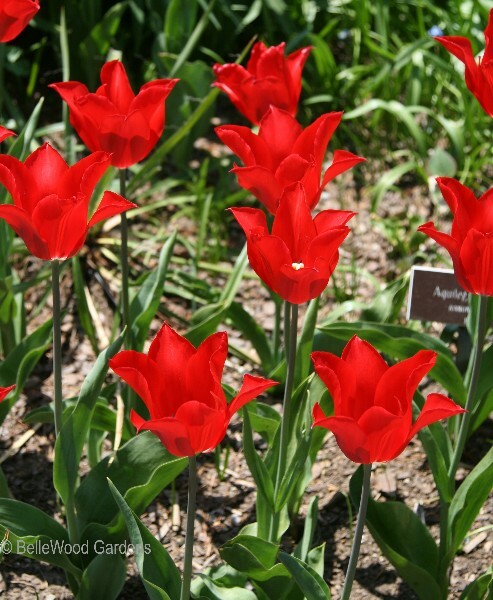 that are among the best of the repeat bloomers in gardens, less prone to summer water disruption. a repeating accent in moderate groups and larger swatches. where full sun and good drainage will make the little bulbs feel at home. 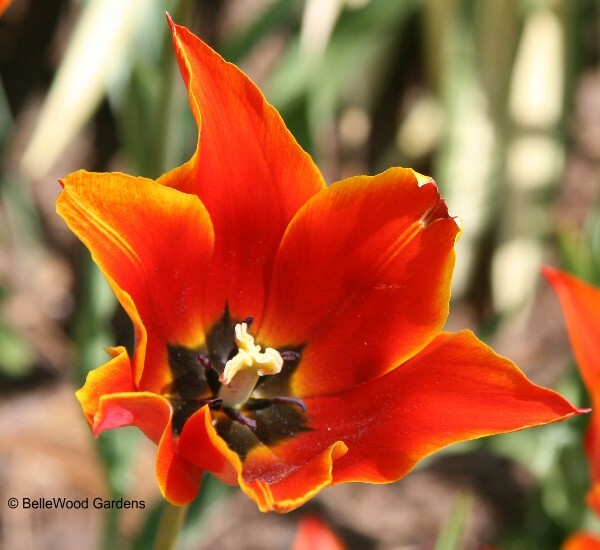 Another of Wave Hill's botanical tulips is far from shy about flaunting its colors. at each petal's base, and a dusky black splotch where they join the stem. I think this might be 'Gudoshnik', a wonderful tulip introduced in 1952.
of Iris pallida 'Aureovariegata' make a fine partner for the garden waltz. But then, that's what I expect at Wave Hill. Persephone has emerged from the underworld, and the earth laughs in flowers. It is Earth Day today. 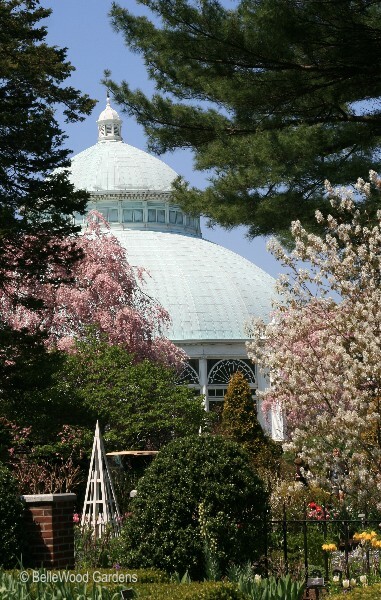 What better way to celebrate than to make a garden visit to The New York Botanical Garden. There was additional impetus, with an invitation to the press preview for Darwin's Garden: An Evolutionary Adventure. A solo trip on one's own can be fun, company makes it even better. I invited my friend Joan to join me and, bless her, she decided that a break from garden clean-up was about due. So on a glorious Spring day with sunshine and mild temperatures we began with the drive from western New Jersey to the Bronx. It was to be one of the most magical garden days I have ever enjoyed. Charles Darwin is an iconic figure. We all "know" about his voyages on HMS Beagle and to the Gal�pagos, the varied and different shape of beaks on finches, and his seminal work Origin of Species. What I, for one, had not really been cognizant of was the pivotal role that botany, plants, and gardens had to play, starting with his days as an undergraduate, during the voyages on HMS Beagle, and to the end of his life. Several of us gathered in the rotunda up on the sixth floor of the Beaux Arts building, and were introduced to David Kohn, Ph.D., eminent authority on Charles Darwin and curator of Darwin's Garden: An Evolutionary Adventure. A quiet man, his enthusiasm for his subject was immediately apparent as he conducted us through the gallery. There's an image of Darwin as a young child, at the tender age of six, together with his sister Catherine. Charles is cradling a pot of flowers in his arms, an intimation of the groundwork plants would provide for his work throughout his life. 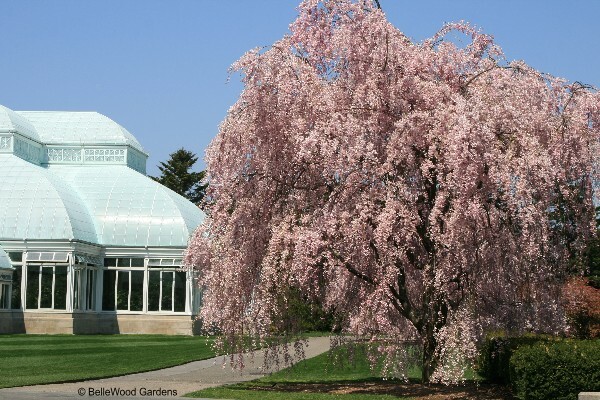 Here are his botany notes from Cambridge, and the class roster for Henslow's botany lectures, Gal�pagos field notebooks, and much, much more. and predicted that there must be an insect with a proboscis adapted to reach the nectar at the base of the long spur of this beautiful orchid from Madagascar. Forty one years later, he was proven correct. 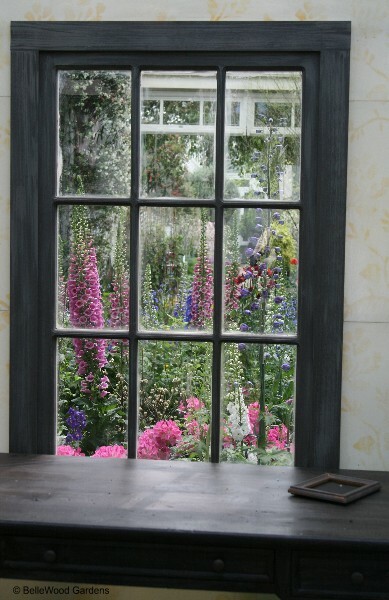 where replication of his wife Emma's garden at Down House reveals that magnificent discoveries can be made right outside one's window. Stepping outside for a moment, Joan and I walk over to the Nancy Bryan Luce Herb Garden for a look at the auricula theater. 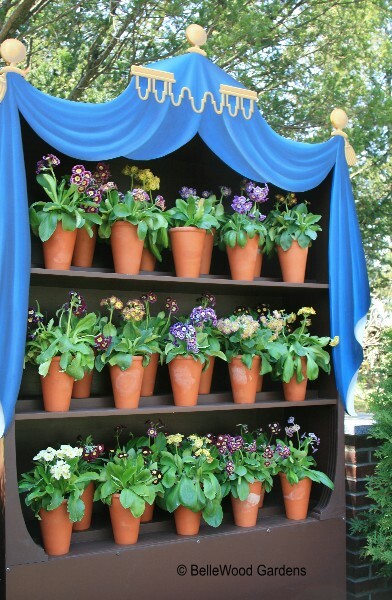 This elaborate staging and display of Primula auricula cultivars was highly popular in 19th century England. 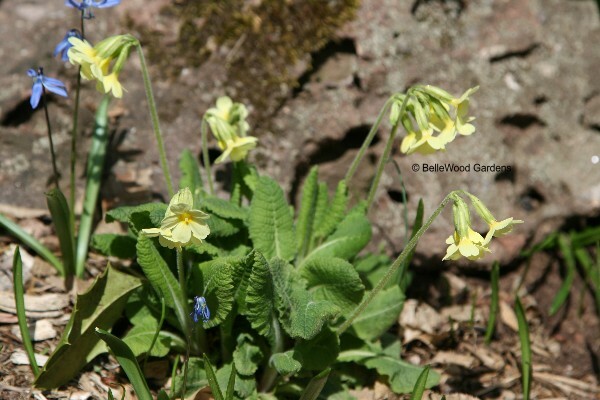 However it was his observations of the little wild cowslips of the hedgerow that gave Darwin insight into a mechanism that the plants utilized to ensure cross-pollination. 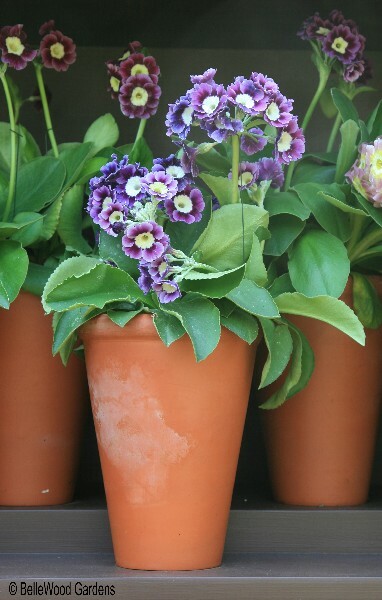 Primroses have two different types of flowers that botanists name heterostylic dimorphism. That is a fancy way of saying that primroses have styles of different lengths. 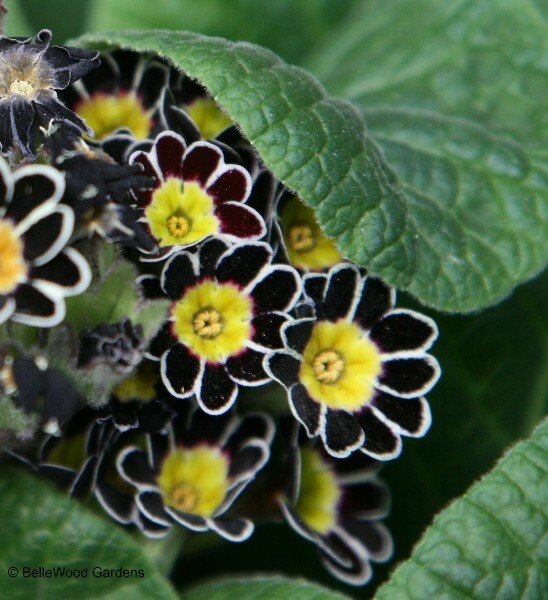 There are plants with pin eyed flowers and other plants with thrum eyed flowers. while the anthers are halfway down the central flower tube in a ring around the style. and the stigma and style are positioned only halfway up the flower tube. It is a means of ensuring cross-fertilization through pollination by visiting insects. And just why does that matter? Darwin showed by experiment that the best fertility - the greatest number of seeds and the healthiest seedlings - was attained when the pollen from a short-stamened / pin eyed flower was transferred to the stigma of a short-styled / thrum eyed flower, or when the pollen from the long stamened / thrum eyed flower was applied to the long styled / pin eyed flower. When the stigma is impregnated by the pollen from the same flower - pin eye to pin eye, thrum eye to thrum eye - it results in incomplete fertility. 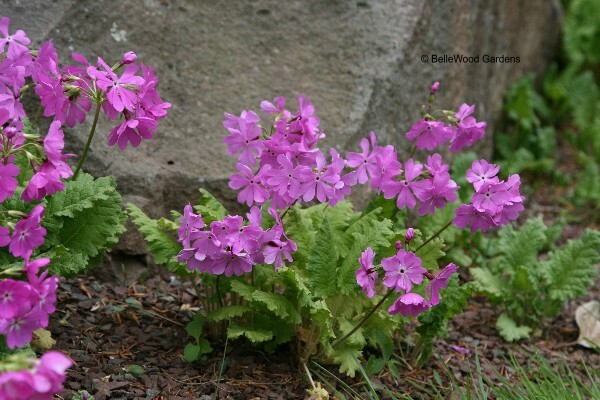 Primula kisoana at BelleWood Gardens. It is a gift, to be able to see what we look at, to find the world and all its mysteries outside our doorstep. I must look more closely at the primroses in my garden, to learn to see what Darwin saw, and first explained why. 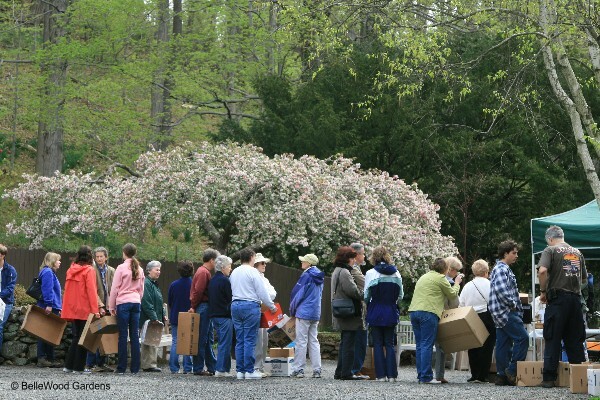 Opening to the public this Friday, April 25, Darwin's Garden is an event that sprawls all over the grounds. There is an exhibition in the gallery of the LuEsther T. Mertz Library, a marvellous English country garden in the Enid Haupt Conservatory, interactive happenings in the Children's Garden, and signage around the grounds providing information relevant to the exhibition's theme. The gallery exhibition in the Mertz Library is open through July 20; the Conservatory exhibition is open through June 15 (with plants replenished as necessary to keep Emma's garden in prime display); and the Everett Children's Adventure Garden through June 29. Do come. You'll be glad you did. Continuing down the road I arrived at Willowwood Arboretum. It has huge grassy fields with bluebird houses, magnificent trees, a modest flower garden, a charming house with small attached lean-to greenhouse, and a couple of outbuildings / barns. Not the place to go if you are looking for refined and formal gardens. 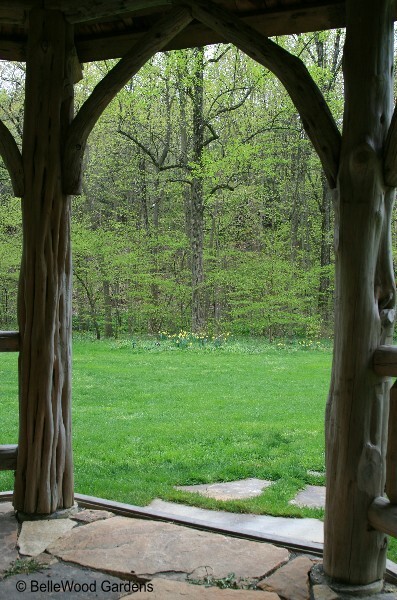 Instead, a wonderful place for a stroll in the county, both out in the open and into the woods. 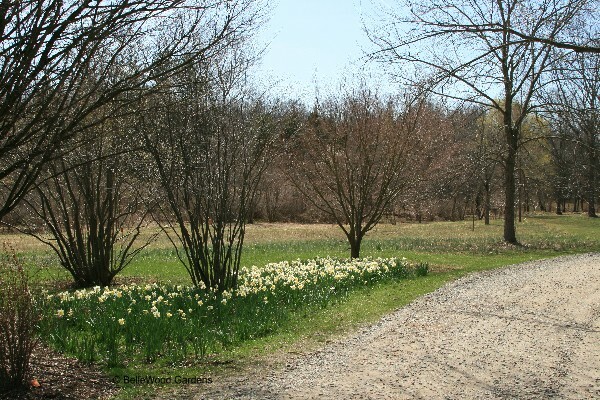 Massed daffodils along the unpaved entry road as you arrive at the parking area. My timing is excellent - these daffodils are at the peak of their display. 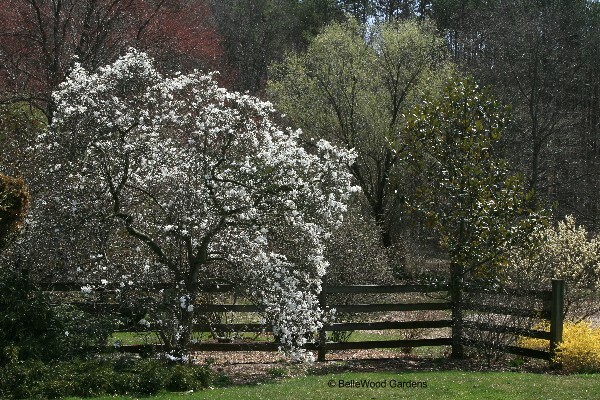 As is this star magnolia in the flower garden. 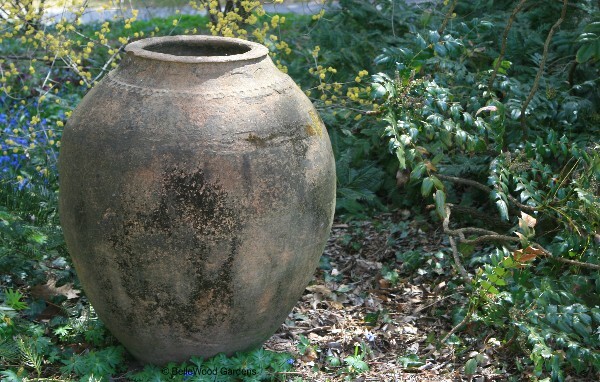 Willowwood has wonderful containers in summer. 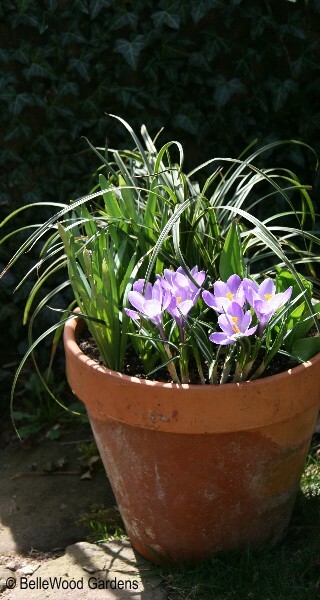 Here's a preview, with some lovely Dutch hybrid crocus. for the brilliant color of these vintage specimens. 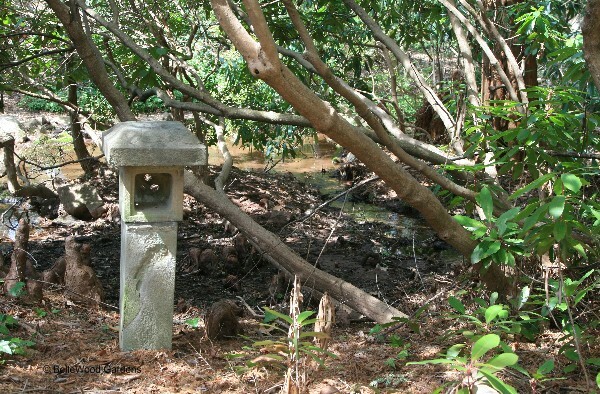 though empty, appears sculptural in the landscape. UPDATE: It is just 18 days later, and looks like a different world. The tender green of Spring carpets the ground, washes over the landscape. 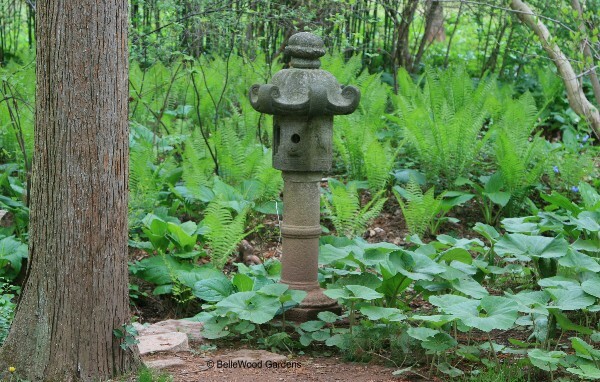 Another lantern, in a different style, seems tangled in rhododendron. Those blobby things behind and to the left? or maybe it's just something they do to give us something to ponder. A sturdy bridge to cross the water. 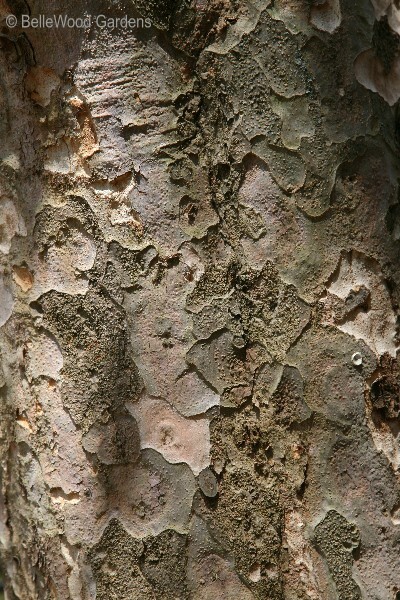 Map-like bark of Parrotia persica, Persian ironwood. 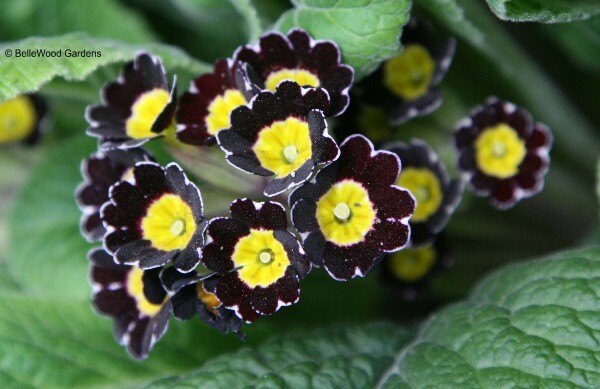 And primroses and Spring, sweet yellow oxlips, Primula elatior. 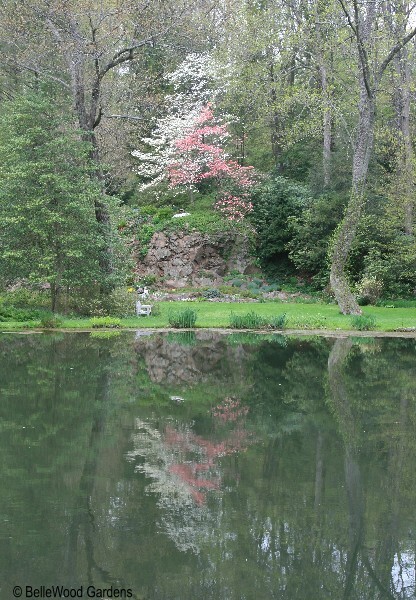 As long as I was at Buck Gardens, I decided to continue down the road and visit Willowwood Arboretum. The best route from one to the other, according to Jim Avens, director at Buck Gardens, would be up Route 512. And since I would be passing right by there, Jim suggested that I make a quick detour to Natirar. What's this? Formerly a private estate belonging to Kate Macy Ladd and her husband Walter Graeme Ladd, in 1983 it was sold to Hassan II, King of Morocco. In 2003 the property was acquired by Somerset County from his son, Mohammed VI. 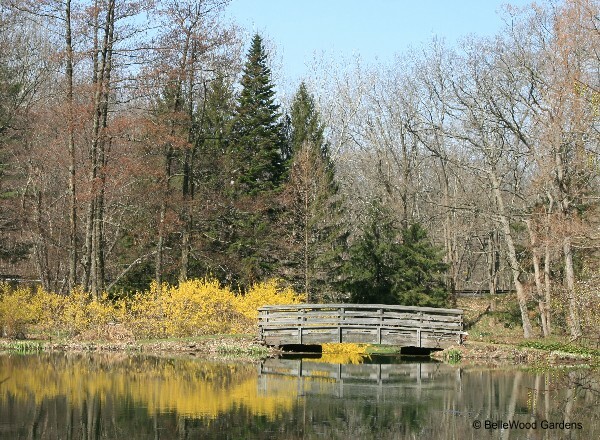 The very new park opened in May 2007 with 411 acres of woodland and rolling lawns, scenic views and trout streams. The mansion, two cottages, carriage house and greenhouse stand on 88 acres that the county has leased to Sir Richard Branson, owner of Virgin Airlines, who is developing it as a retreat facility with a full-service spa, conference center and restaurant that will be open to the public. 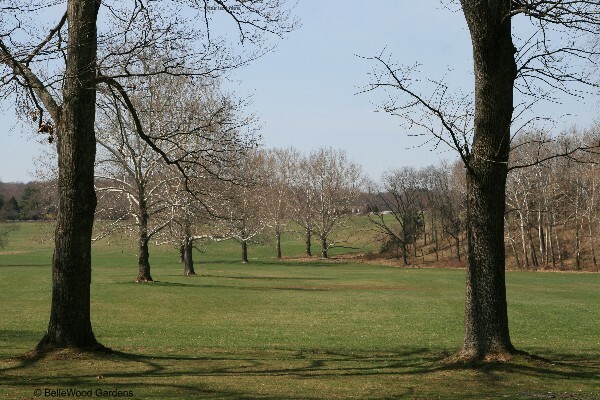 The other 403 acres will be maintained as open space. 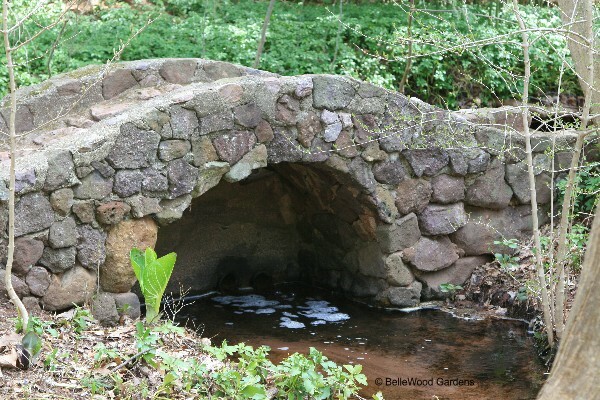 The Raritan supports a healthy trout fishery, and the Peapack, its tributary, supports breeding populations of the threatened native brown trout, and these trout streams will be protected. Its heritage as a working cattle and haying farm will be maintained. A gracious view across the sweeping lawn, embellished with majestic trees. And if you are wondering what Natirar means, it is an anagram for Raritan, the river that flows through it. 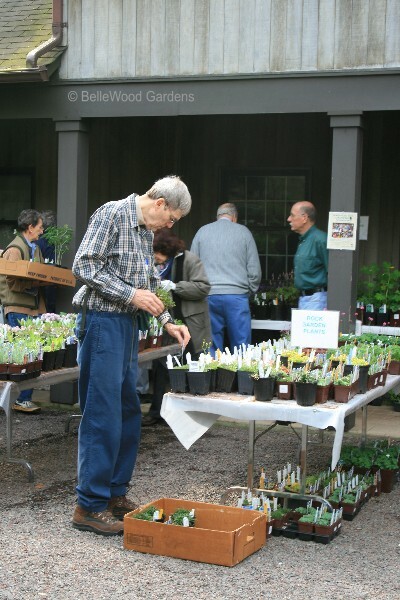 There's going to be a plant sale at The Leonard J. Buck Gardens on Earth Day weekend, Saturday, April 26 and Sunday, April 27. Choice perennials, ferns, and woody plants from specialty nurseries are just part of the offerings. 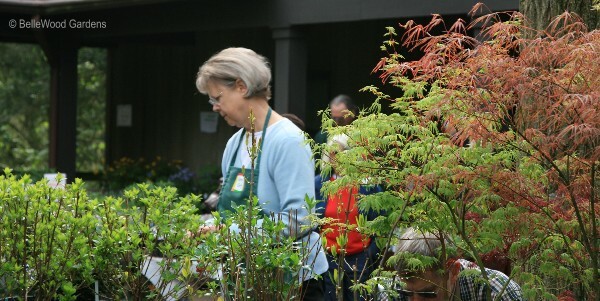 This annual event is a joint effort with the Watnong Chapter of the North American Rock Garden Society, whose members also donate plants from their gardens. 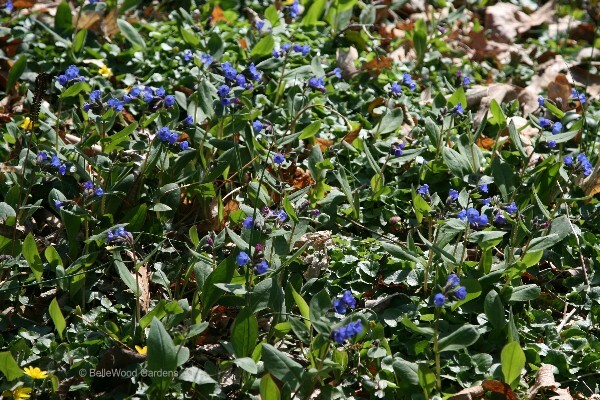 As a member of that organization I've been digging and potting, and had enough Mertensia virginica, Virginia bluebells; Pulmonaria saccharata, lungwort; and Phlox divaricata, wild sweet William, to make a worthwhile delivery. 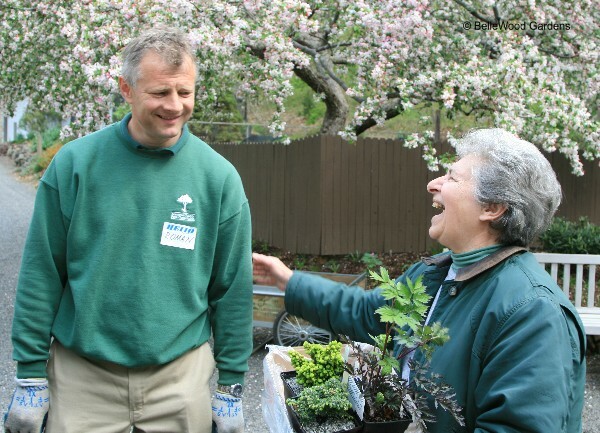 (Donated plants have to be delivered no later than Tuesday, April 22 as all donated plants must be inspected by a State of New Jersey Plant Inspector.) After that minor task is accomplished, why, since I'm already there I might as well enjoy a stroll around the grounds. And what a difference from my visit early in March. 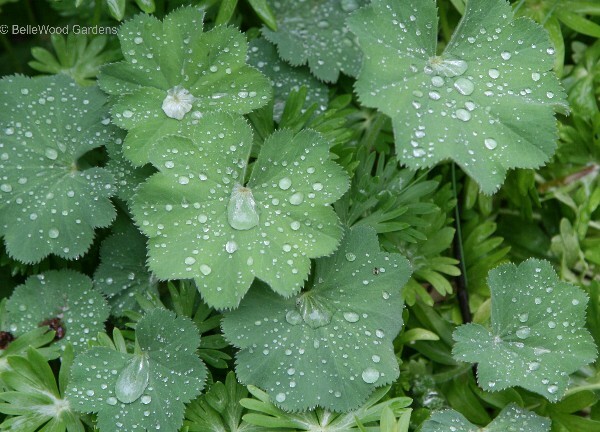 of Ranunculus ficaria spangle the grass, totally resistant to two attempts to delete it using glyphosate. 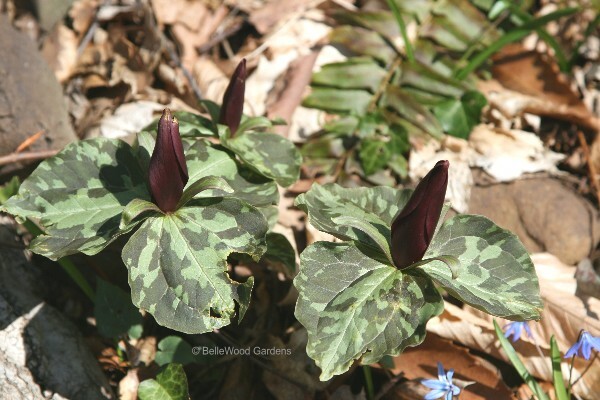 Classier and elegant flowers are also in bloom, such as these Trillium cunneatum. Morning sunlight illuminates the sky blue flowers of Pulmonaria angustifolia. Primroses mean Spring. 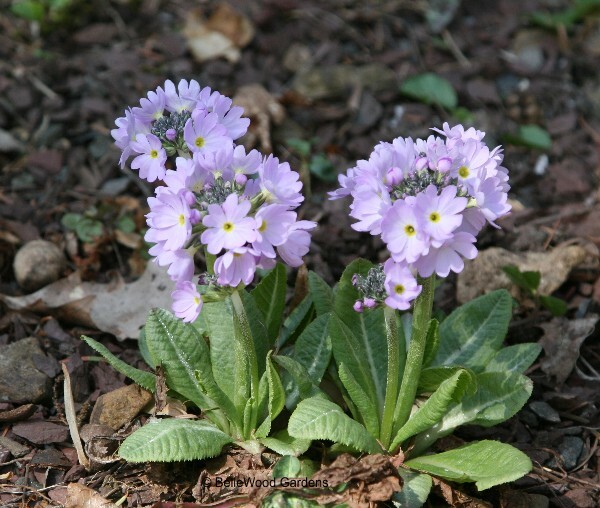 This dainty charmer is Primula denticulata. 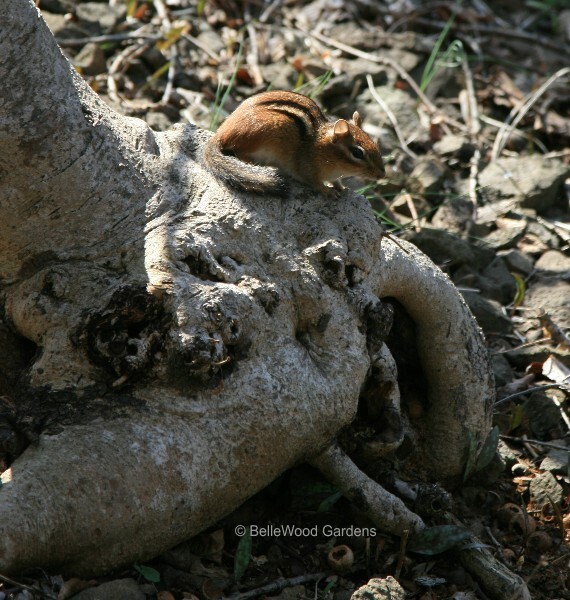 make themselves quite at home among the rocks and roots. Skunk cabbage doesn't get much respect. Well, what can you expect with a name like that. from Kamchatka down into Japan, rejoicing in the name of Lysichiton camtschatcensis. 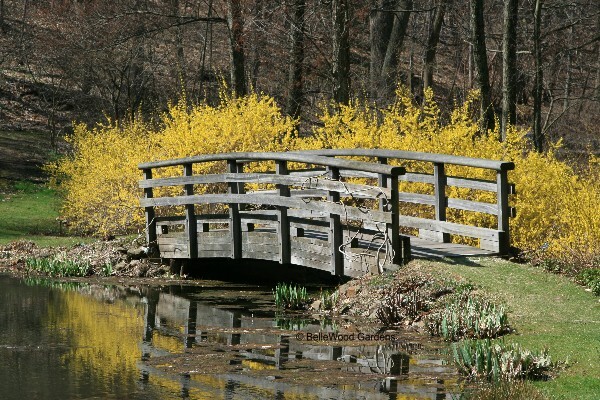 of golden forsythia, reflecting in the still water of the pond. 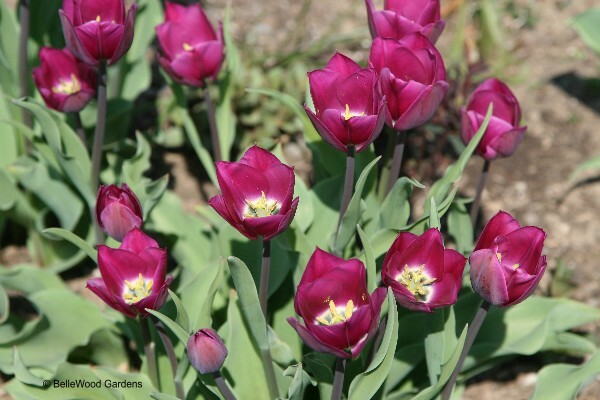 and yellow-eyed claret cups of Tulipa humilis, with the steel blue domes of dianthus foliage in the foreground. 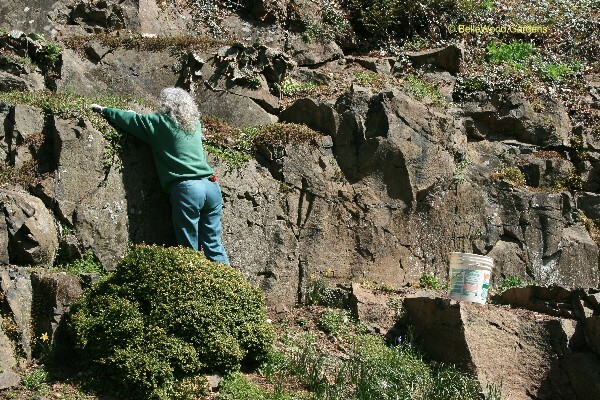 Careful, patient weeding is needed to keep the dainty plants on Big Rock from being overrun. and guided tours of this magnificent naturalistic rock garden. For additional information telephone 908 234 2677. 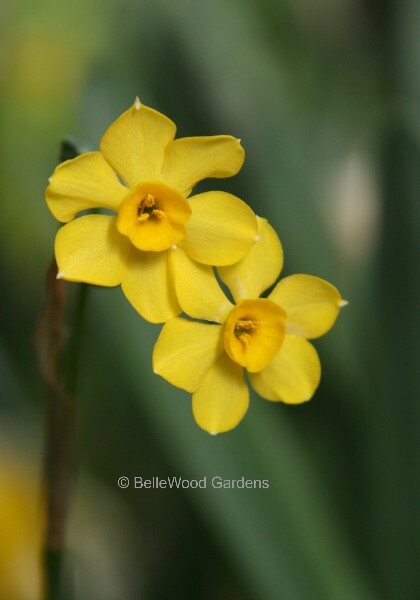 Each Spring daffodils offer such wonderful rewards to the gardener who takes time to plant them in the fall. 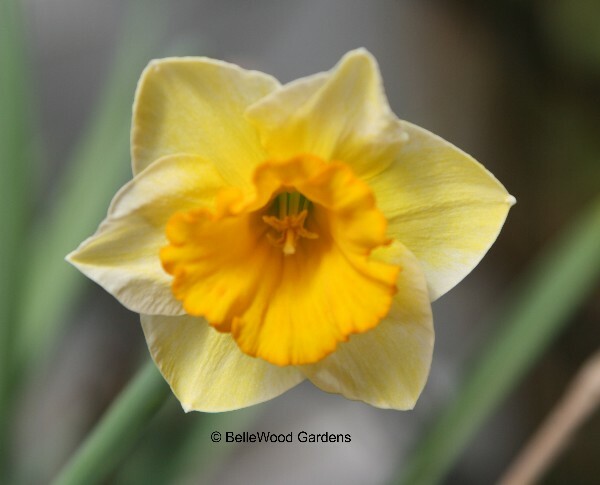 Deer resistant and tolerant of deciduous shade, they survive adversity - I've seen daffodils flowering year after year at a burned out, abandoned house, and another little group that struggles through an asphalt sidewalk laid over them. 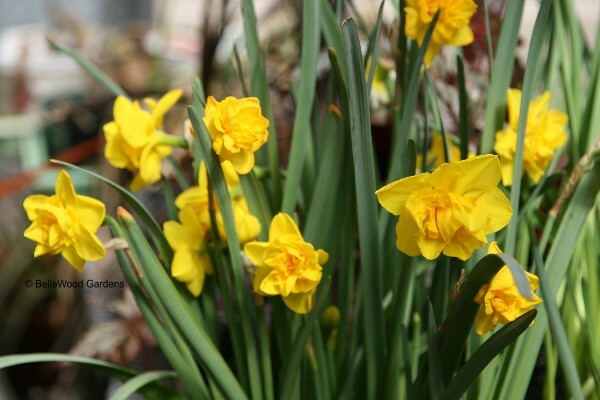 Unlike tulips that dislike summer rainfall or irrigation, daffodils enjoy my local weather pattern of year-round precipitation, winter cold and summer heat. Their color range may be more limited than tulips rainbow hues, yet I'd really miss the sunny charm they offer on a gray day in April, or their dancing flowers on a sunny, breezy day. Unlike snowdrops, whose variations are subtle, demanding a discerning eye, daffodils offer enjoyable variations on a theme of yellow. Last December there was a knock at my door. It was the delivery of an unexpected box from Brent and Becky's Bulbs, one of my favorite vendors of both hardy and tender bulbs. It was part of a distribution to Garden Writers Association, asking the recipients to trial these bulbs, then report back on the results. 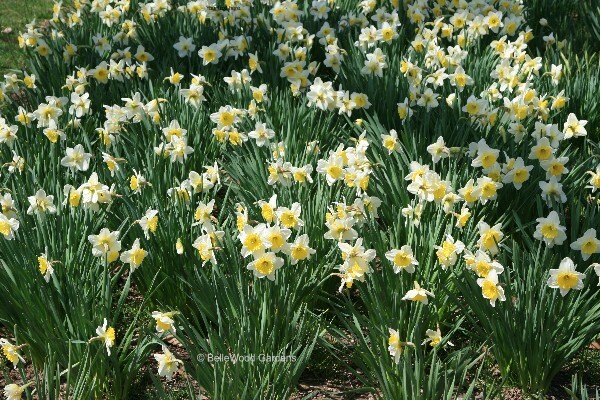 There were 10 bulbs each of ten different daffodil cultivars developed and selected by Brent and Becky. What fun! But it was already December. And, I shame-faced, confess there were still some bulbs I'd ordered waiting to be planted. What to do? Simple. I potted them for slow forcing. Understand that leaving them sit around until Spring is not an option. You wouldn't keep an onion for five or six months and expect it to be useable. Mother Nature never intended that flower bulbs leap forth from the earth, lie around for a while, then dive back underground to grow and bloom. Bulbs are, however, obliging about this sort of treatment. But there are limits. 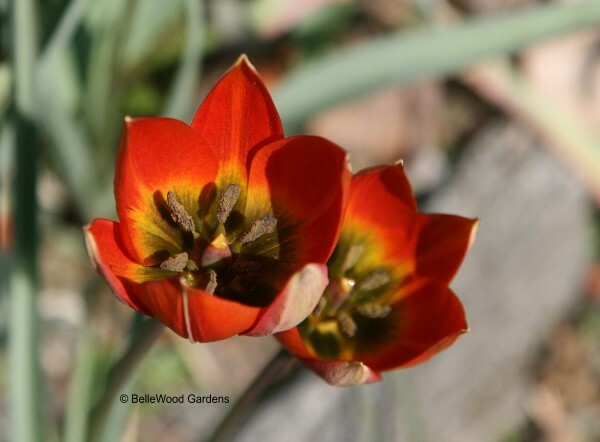 It is possible to coax them into flower in advance of when they'd bloom in the garden. But they need time to root, and a cool period for vernalization. (Translated from the Latin, vernalization means "belonging to Spring". It refers to the cold period, several weeks long, required by certain plants before they can initiate growth or flowering.) I usually pot bulbs for forcing in September. 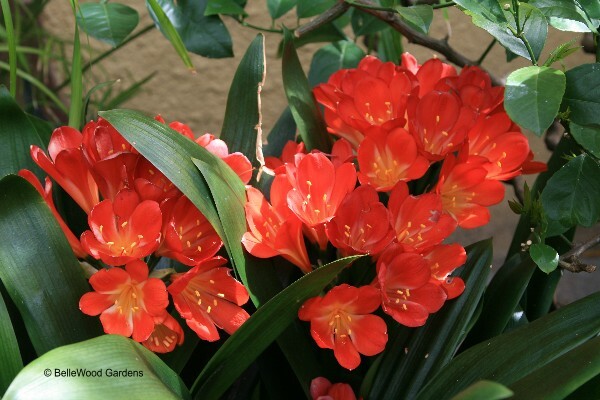 That provides hyacinth, tulip, and daffodil flowers in January and February, while it is still most definitely winter outdoors. 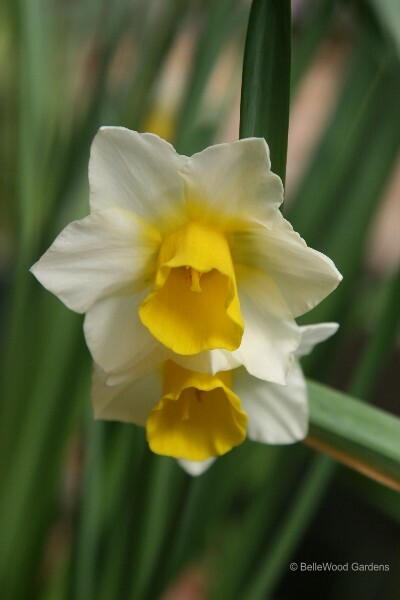 Potting these daffodils in December would bring them into bloom in March or the very first week of April. BelleWood Gardens is on the shady side of the road, and in most years my daffodils are just opening by the second week. 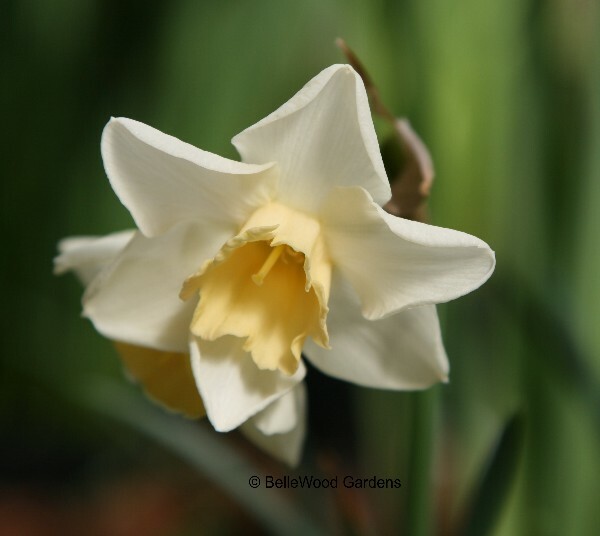 Remember too, that different kinds of daffodils open at different times: poeticus cultivars don't bloom until early May. So the bulbs were duly potted up, labeled. given a good drink of water, and then set in the garage. Unheated, temperatures don't drop below freezing but do stay in the low 40s, even down to 38� Fahrenheit. Shoots were making an appearance by the beginning of March. I then brought the pots into my greenhouse, which is only heated to 50� Fahrenheit, and set them on the floor where temperatures are cooler than up on the benches. Daffodil days came early this year! 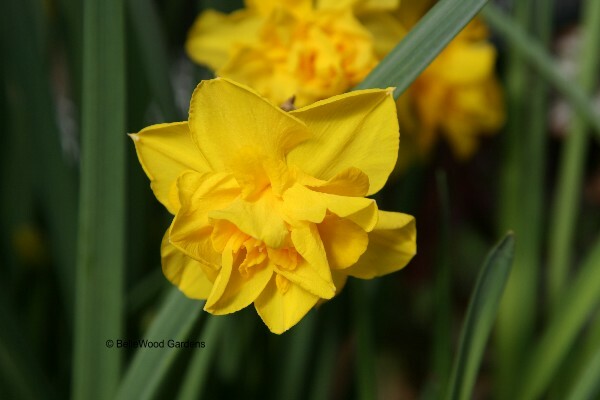 Daffodils are classified into over a dozen categories. you would look for 'Double Smiles' in Brent and Becky's bulb catalog. 'Mary Gay Lirette' looks sort of like a double. But she's not. The cup or trumpet is split and folds back against the petals. 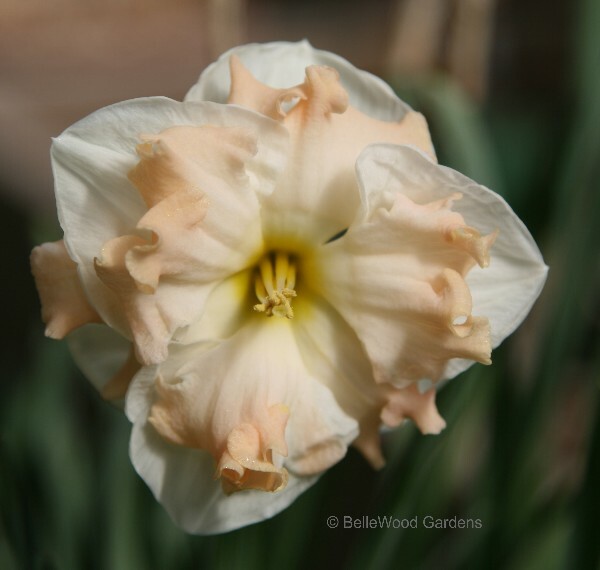 That means this cultivar is classed in Division 11, split corona or collar daffodils. marvellous against the pristine white petals. Sometimes there's a little kerfuffle about where a daffodil belongs. 'Baby Boomer' for example. By parentage it should be classed in Division 7. (about 6 inches tall) led to its catalog listing in Miniatures. would be more intense when grown outdoors where the light is stronger. 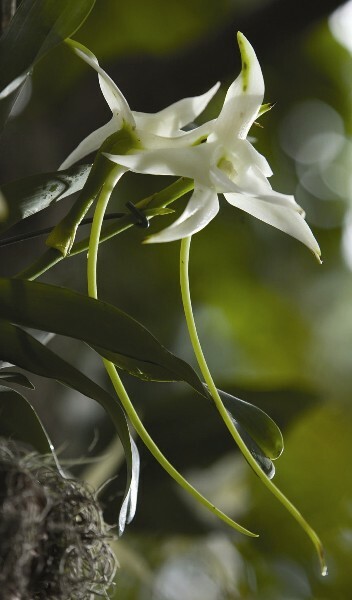 of its cup melts and spreads onto the base of the clean white petals. 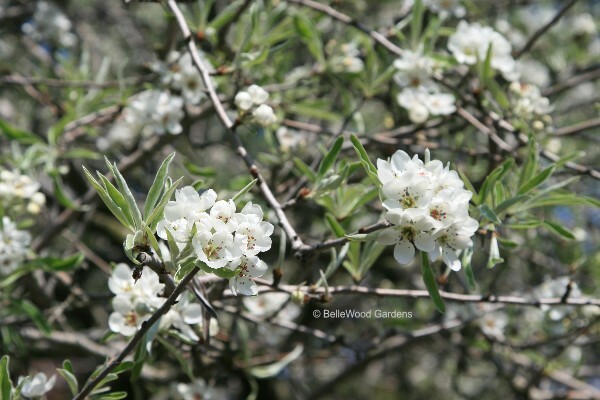 with a sweet scent from its jonquilla pollen parent. What a wonderful present. An indoor prelude to Spring.